Over the last week or so you may have seen my tweets about the new menu that P.F. Chang‘s is rolling out. Looks pretty darn good doesn’t it? Last night I was afforded the opportunity to head on in to the Northpark P.F. Chang‘s location to sample the new items…you see, the only problem is, “sampling” in my head means EAT IT ALL. I started off with the Red Sangria. Made with Absolut Mandarin Vodka and Merlot, it was crisp, refreshing and had just the right amount of sweetness. You know how sometimes, sangria can just be way too sweet? Not this one. The only downfall with this was that the glass wasn’t as full as I had hoped for. At $9 a glass, they better fill ‘er up so this lush can get down to business! 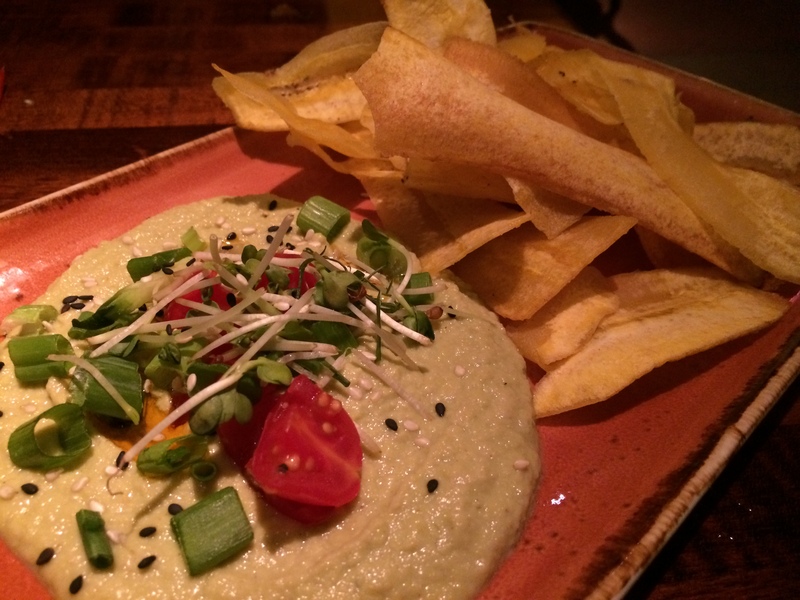 To get the party started, I knew I had to order the Edamame Hummus. Fresh Edamame blended with sesame seeds, ginger and even a bit of chili, the hummus was smooth and rich in flavor while still managing to be light. Topped with green onions and tomatoes, it is the perfect menu addition now that the hell like summer temperatures are here. Next up, the Ahi Tuna Tartare with Avocado. Ahi mixed with diced cucumber sits upon sliced avocado and a surprisingly spicy cream sauce which wasn’t listed on the menu so if you aren’t a fan of a little kick, you’d be in for a shock taking a big mouthful of if. Luckily, I don’t mind spicy food but it definitely would have been nice had it been noted. 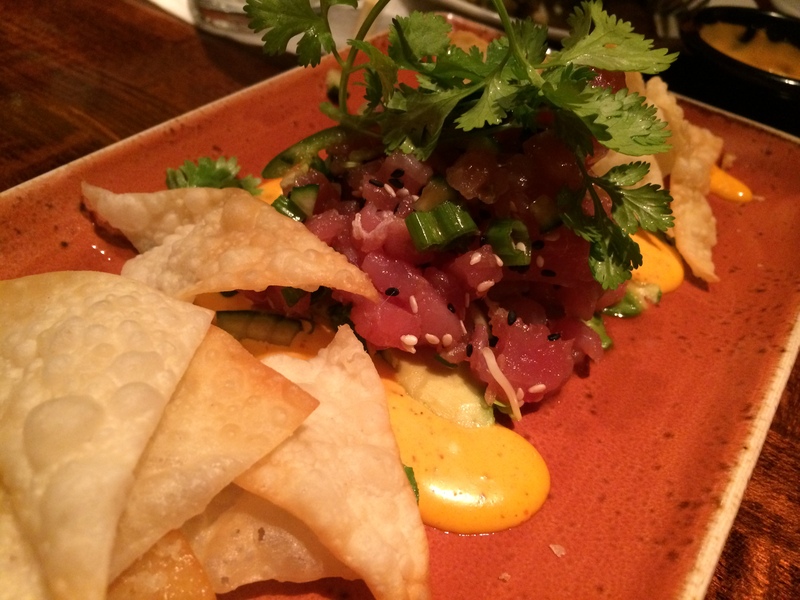 Crispy wonton chips accompany the tartare and it is the perfect combination. Crispy and indulgent chips that manage to not be greasy are exactly what I would have hoped for in a dip situation appetizer. Take notes, edamame hummus. Now, a huge driver of the new menu at P.F. Changs is based the fact that they are now serving sushi. Hand Roll’s of any kind are always a must order whenever I visit a sushi restaurant, so I was excited to see the Tempura Shrimp Hand Roll on this menu. Although it isn’t a hand roll in the traditional sense as it is wrapped in soy paper instead of seaweed, it was utterly delicious. 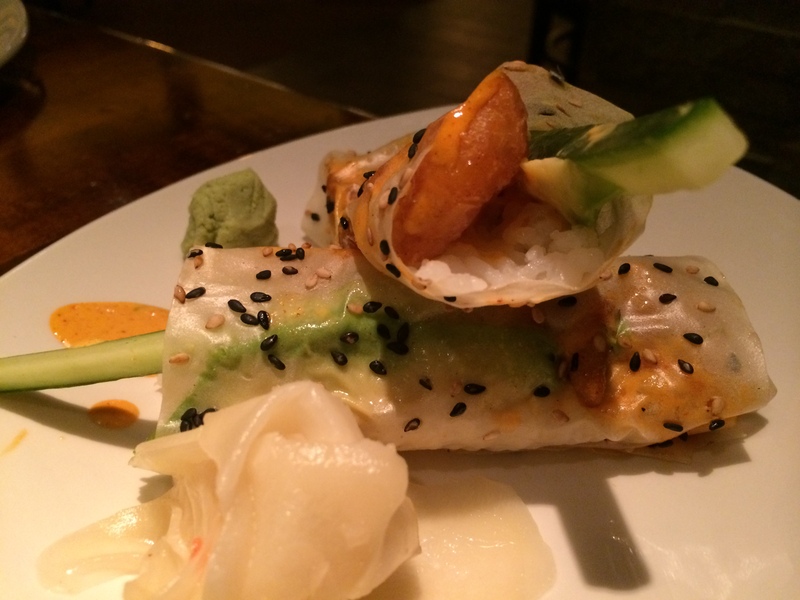 Plump, crisp shrimp, avocado, cucumber and rice are all wrapped up like a little gift from the kitchen. These will definitely be added to my list of staples while visiting P.F. Chang‘s in the future. With the hand roll being impeccable, I thought for sure that the rest of the sushi would be on point, as well. 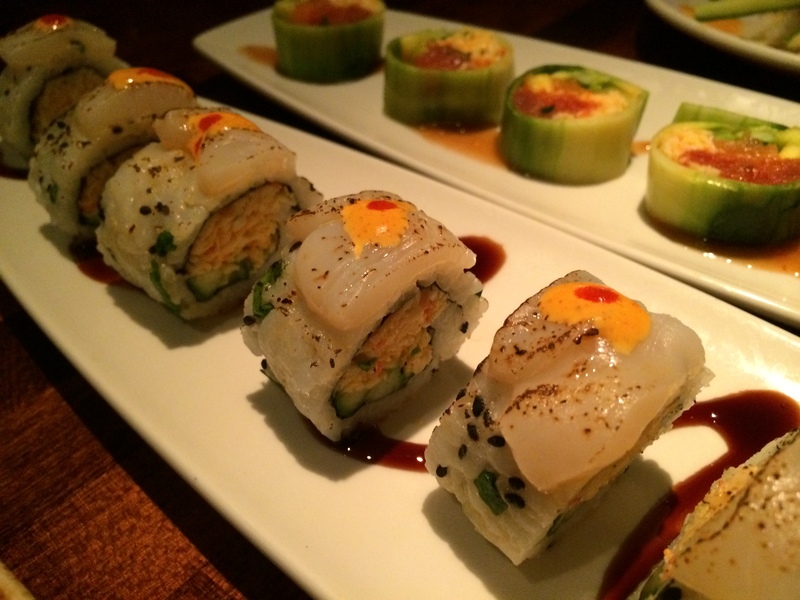 I had my waiter suggest which two rolls to order and he recommended the new Dynamite Scallop Roll and the Cucumber Rolled Kappa Maki…sounded good enough to me! Both arrived at my table looking gorgeous and I couldn’t wait to dive face first on them. Unfortunately, that is where the love affair ended. The concept is there but the flavor profile needs to be fine-tuned before I’d recommend ordering this item. ANYWAY, moving on. For a brand new menu that I was able to try several items from, there was only one thing I wouldn’t order again so I would say that the odds of this new menu being successful are definitely in P.F. Chang‘s favor. Aside from being tasty and visually appealing, the new menu is also part of tons of other new and exciting aspects of the restaurant. From a $3-$7 Happy Hour on weekedays from 3pm-7pm, to-go lattes AND new lunch pairings under $10, the folks at P.F. Chang‘s are truly sparking something new. Huge thanks to P.F. Chang’s for sending me over a gift card so I could try these new menu items on the house! The Red Sangria is so good! I also had the shrimp tempura roll and loved it! This was my first time ever eating sushi.